As I've recently become an adult with a proper job, for the first time in my life I have had an income that covers more than just food and rent. This revelation prompted me to consider how best to invest my surplus income and make the most of the savings I had been able to accrue. There are many options out there, and the most long-term-saving-for-the-future-sensible option would probably be to save up for a deposit on a house and start renting it out to pay off the mortgage which would provide a long term cash producing asset that could fund retirement plans, or even begin to fund future investments or ventures. However I'm still one of those young techy types, so my eyes were drawn to crypto currencies as it's something that I have had experience with before*, and it is an extremely interesting technology to try and get to grips with. In learning about crypto I feel like I am investing more than money as the skills learned from trading will be applicable to the stock market and the lessons learned about crypto could be a great part of a CV in the future, especially if blockchain technologies becomes as mainstream as it is hyped up to be. * I was mining BTC with my 5870's back when BTC was < $200. Sadly I think I spent it all back then! For the last few months I have ventured into this space and put my real money on the line. Along the way I have learned a lot about how best to approach investing as well as a tonne of practical advice. So in this article I hope to share some of these tips and guide you through how best to get setup. I won't really comment on strategies for investing or trading, I'm far too new to this to world for my opinion to be of any value! What I will focus on is how to get to a point where you can start trading and investing with ease and security. One barrier to entry with the crypto world is the huge amount of jargon to learn, both from the technical side and from the trading side. For trading terms a lot of them are going to be identical to the stock trading world, so if you are familiar with that you will have a nice leg up. However if you aren't so sure on what an order book is or what a limit order entails, and want to get some definitions, I've found that looking up a term on investopedia has been really helpful. For the tech side of things, it gets a little more tricky as every crypto currency will not only have it's own technical differences to all the others, but will also have it's own branding and marketing. The best way to start understanding it, is to really get to grips with how Bitcoin works, as it was the foundation that all future coins have been built on. I've looked at many resources that try to help and explain Bitcoin, but none have matched this video by 3Blue1Brown. I highly recommend you watch it and do some reading on how Bitcoin and Ethereum work, and how they differ. Even if you are coming to crypto just to invest, and have no real interest in the technology, it is worth doing, as looking at the viability of a coin based on its technical merit is a key step in assessing whether it is a good investment or not. One of the other barriers to entry is finding a way to buy Bitcoin easily and safely. There are a few options out there, such as localbitcoins.com that are just for the sale of BTC, or alternatively most exchanges will have some system to allow you to transfer money to be used as fiat*. * fiat is a term used to describe "real world" money, used to by assets. Investopedia definition. Personally the best way I have found to do this step is to sign up to Coinbase and go through their full verification process. This allows you to transfer money directly from your bank to your coinbase fiat wallet and back with zero fees*. Now that you have fiat it is time to buy some coin! * Well there is a £0.15 fee to transfer out! Coinbase fees. Coinbase offers a really easy "idiot proof" service to buy coins and track their value, however these methods have really high fees, especially if you are using a credit card rather than a bank transfer. Coinbase is actually tied to a popular exchange called GDAX. Using your Coinbase account you can login to GDAX, and then deposit your fiat directly to your GDAX wallet for free, and then use it to trade for BTC, LTC or ETH with much lower fees than on coinbase. If you are already a seasoned trader you can probably skip this bit, but I feel like it's really important for people to know what they are looking at when they are first confronted with all of the flashing lights that an exchange can offer. If for no other reason than to try and help avoid someone making an expensive mistake*. * When Bit-Z first listed ark, someone bought 1 ARK (~$3) for 0.3 BTC (~$1900). The important bits to observe are the current market value (the value a coin last sold at), the volume (how many coins were sold in a period), and the order book that contains all of the buy and sell orders. Every exchange has a different interface but they mostly have these key elements in some form or another. GDAX for example (shown above) has the market value shown with a line graph and candleticks, behind that is the bars representing the volume (number of transactions in that period), while just below that is a visual representation of the order book. The order book can also be seen in more detail on the left panel. The red half of the order book represents sell orders, each entry is someone wanting to sell an amount of coin for a given price. The green side is the opposite it's people wanting to buy. The gap between the two is known as the spread. To buy some coins you need to setup a buy order. Your first option is to buy at market value which means the order will be instantly filled with the cheapest available sell offers. Alternatively you can place a limit order at a certain value that you believe the currency will drop to. You would then have to wait for someone to be willing to buy the coin at that value and fulfill your order. Selling is essentially the exact same process in reverse, the only important thing to remember is to try and sell at a price higher than you paid! There are more options, but those are the simplest and I think this is going to be long enough already so I better not go into too much more detail! Once your order is filled you will now be able to see your coins in your wallet on GDAX. I recommend buying a test amount of Bitcoin first of a value you are 100% okay with losing. With this you can test out the rest of the process of investing and cashing out, before committing real money. Now that you are the proud owner of some crypto currency, you might want to consider how best to store it. Due to the nature of blockchain technologies, the owner of a private key for the currency address has complete (fairly) untraceable access to the coins in the address. Meaning that if someone were to take your private key, or you were to lose it, the coins are gone. Forever. Because of this I decided to invest in a hardware wallet, what is effectively an encrypted USB stick with some accompanying software designed solely for the purpose of securely storing your private keys to your wallets. The advantages of a hardware wallet are that your coins are not stored on a device that is connected to the internet (not even electricity!) which means that to get to the private keys, you would need to physically steal the device and beat the passphrase or seed out of the owner. I opted for a KeepKey, however I think I would now recommend a Ledger Nano S as the KeepKey only supports a very limited number of coins, whereas the Ledger has been more widely adopted and has seemingly much better support for new coins. The downside of a hardware wallet is that if you want to make a trade, you have to first move the coins from the hardware wallet to your wallet on the exchange, which can take a while in the case of Bitcoin. This can prevent you from trading sometimes if you only have an hour of free time and see that you want to sell right now but your coins are locked away, it can be very frustrating. However coins stored on an exchange are subject to attacks from the whole internet and in the past exchanges have gone rogue and taken customers coins, so it's a risk you have weigh up and decide what will work best for you. Personally when we are talking about large amounts of money I would much rather trust my coins to be physically stored offline, so I would recommend getting a hardware wallet. I recommend that your first purchase is in Bitcoin, this is because bitcoin enables you to enter many other markets for what are known as "altcoins", essentially "any other coin but bitcoin". The biggest ones are currently Ethereum, Litecoin, Ripple and Monero, however there are literally thousands of others out there. Some exchanges will have fiat/altcoin markets where you can buy altcoins, GDAX has LTC and ETH listed, however to get the lesser known alts you will need to find a BTC/altcoin market on another exchange. Once you have found an exchange with the market you want, say BTC/XMR, you can send your BTC from your wallet to your wallet on the new exchange and begin to trade BTC for your alt of choice. This is all well and good, but why would you want alts in the first place? 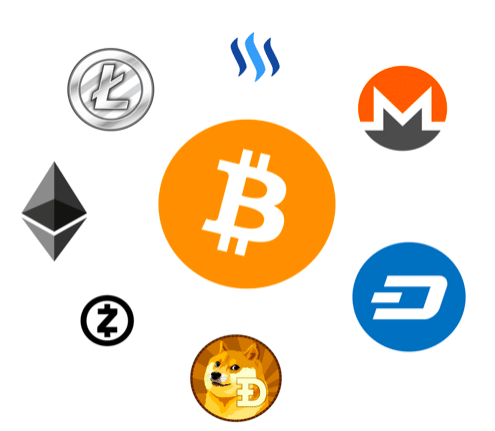 Well for a variety of reasons, altcoins all offer some unique opportunity, some like Monero (XMR) offer complete and total privacy while others like Ark offer lighting fast transaction times and smart bridges. Every different coin aims to find a niche in the market, and some niches might suit your interests more than others. The other main reason to look into altcoins is that when compared to BTC they are even less stable, and can offer exponential gains. It's not uncommon to see a coin gain 20% or 30% of it's value in a single day, which if you are paying attention can lead to some quick profits. Another way of looking at it is as a more long term bet, IOTA for example is an ambitious project not based on blockchain but a tangle, and it aims to be the currency for the future of IoT (Internet of Things) devices. The world of IoT is a long way off, but something like IOTA might be part of making it happen. I'm not recommending investing in IOTA right now, it has some technical issues that put me off for the time being, but it is a nice example of an altcoin that could be seen as an investment in the future. Gee golly there is a lot of numbers! One of the most difficult parts of building a crypto portfolio is keeping a track of everything, and being able to monitor how the markets are doing. First of all the place to go for getting the bigger picture of how different coins are performing, what exchanges they are listed on and links to their wesbites and wallets is coinmarketcap.com. I use an android widget on my home screen that pulls data from their API's so that I can stay up to date. If you were to just keep your coins on one exchange it would be fairly simple to keep a track of their value (provided the exchange has a nice interface), however I quickly found myself in a position of owning several different currencies from a variety of exchanges, each with their own wallets and passphrases. Thankfully there is a solution to this quandry, it does take a bit of manual effort on your part, but if you sign up for cointracking.info you can enter all of your transactions on all of the different exchanges, and they will keep a track of their value and any gains (or losses) you make. To import your trades you just need to go to "Enter Coins > Exchange Imports > Your Exchange" and follow the instructions. It's a bit different for every exchange but the basic process is logging into the exchange and exporting your trades as a CSV and then re-uploading it cointracking.info for processing. You can then see your entire portfolio in one place with some really nice visualisations of how it has performed over time. I also installed their android app and widget to allow for instant updates whenever I look at my phone. If you have made it this far and are still interested in this curious little world, I recommend you give it a try. Start with buying some BTC, put half of it on your (hardware) wallet for safe keeping, then use the rest to try out some altcoins. Update your portfolio on cointracking, make sure your coins are secure on your (hardware) wallet(s), then sit back and hodl on for dear life. Or don't, you can try your hand at day trading your coins to try and maximise any gains you stand to make. I think this is a fine art that requires a lot of time and attention. I've dipped my toes in a few times and I've been burned every time, usually because to trade effectively you need to be able to sit down for a day and give it your undivided attention, which isn't something I've been able to do lately. If you fancy giving it a go I recommend starting with a small amount and picking a coin with a slightly lower transaction volume so it's easier to keep up. If trading isn't for you and you are happy with the process and have setup all the various accounts you need for being an astute investor, I think the best thing you can do is to just try and stay up to date with news in the crypto-sphere and be ready to make react to any big events. For example we recently had the sudden cancellation of the BTC 2x hardfork which threw the market into chaos, and was a great time to sell off some alts and buy BTC. Some resources I use for keeping in the loop are the /r/CryptoCurrency subreddit, which needs to be taken with a pinch of salt, some YouTube channels (big list) such as Crypto Investor, and slack channels for altcoins. These are particular good for more insider knowledge specific to a coin. The other thing you can do is to slowly expand your knowledge of what the different altcoins have to offer and how easy they will be to work with. A good place to start doing this is on coinmarketcap.com from there you can see some statistics and then click through to the project's website. There are four things to consider when evaluating a new coin, aside from just the numbers. What problem does it solve with its tech? How easy is it to buy / sell / store? What is the community around the project like? Finding the answers to these questions is a quick way to get a picture of how much you like the project, but always do your due diligence and read as much as you can. There are some projects like Bitconnect which are clearly pyramid schemes. Another dangerous area is with ICO's (Initial Coin Offerings), this is when a company offers a sale of its coins that have been pre-mined for dirt cheap, as a way to fund the future of their project. There have been many legitimate ICO's for excellent projects like Ark or Neo, however it's now seen as easy money and there are more and more ICO's being launched with dubious intentions. You can get an overview of how well (and how badly) some ICO's have done on icowolf.com. There is clearly a lot to take in, so if it all seems too much I wouldn't blame you; go and buy a house it will probably do you better in the long run, although I've heard that isn't exactly simple either! If you have enjoyed this however and want to learn more, I hope that this post has given you a solid starting point on how to get setup, and will help you to avoid making some of the mistakes I've made along the way. For the purposes of full disclosure I currently only hold BTC, LTC and Ark, of which you can tip me a beer at any of these addresses!